The Galena Lady Bears golf team is pictured above. From left to right are Savanna Baker, Madison Jennings, Madeline Scott, Becca Baker, Lexi Miller, Katelyn Lebow, Chalice Sherer and Coach Bob Baker. Scott, Becca Baker, Miller and Lebow took home medals from the SWCL golf tournament on Friday, October 5. 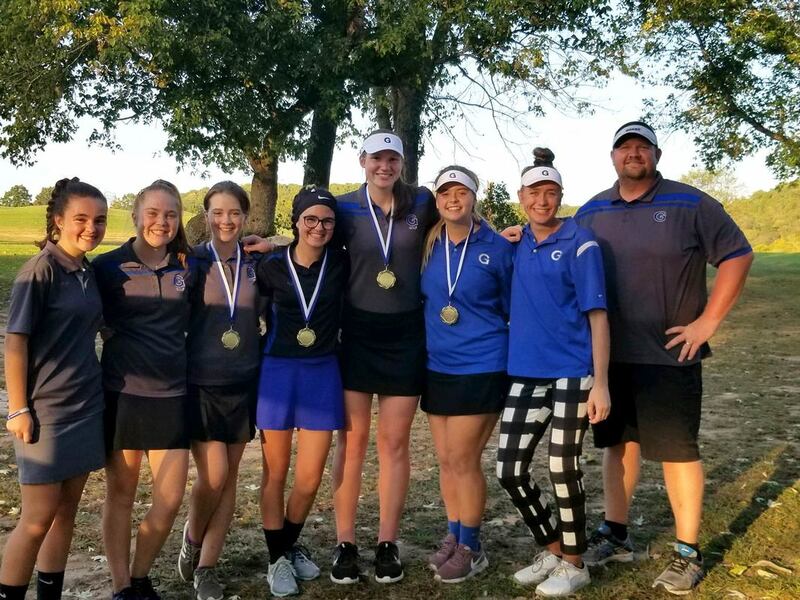 The Galena High School girls golf team competed in the inaugural SWCL Girls Golf Tournament on Friday, October 5, at Indian Tree Golf Course. The Lady Bears secured 1st place in the meet with a combined score of 435. Purdy finished as the SWCL runner-up with a team score of 486. Shelby Haskins of Purdy High School finished as the SWCL individual champion with a score of 92. Haskins, along with fellow Purdy teammate Ashlie Johnson, recently qualified for the Sectional Tournament at Fremont Hills aon Monday, October 8. Other SWCL medalists included 2nd place finisher Becca Baker from Galena with a score of 106, 3rd place finisher Lexi Miller from Galena with a score of 108, 4th place finisher Katelyn Lebow from Galena with a score of 1100 and 5th place finisher Madeline Scott from Galena with a score of 111. The SWCL Tournament concludes the fall season for the Lady Bear Golfers but they are looking forward to an even stronger 2019 season with all golfers returning next year.